Attainments in UK Amateur Microwaves can result in a range of attractive trophies and awards . . .
Until recently the RSGB has administered a range of Squares Awards on all bands above 30MHz. 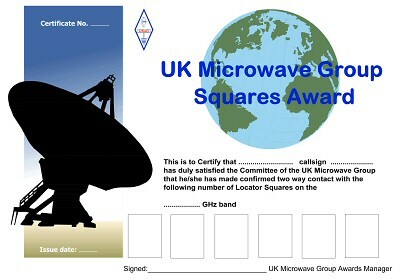 In 2010 the UK Microwave Group agreed to take over the running of the Microwave Squares Awards, and we are now re-launching them with a new certificate design. The rules have not changed significantly, and existing RSGB records have been transferred so that claims for extra stickers to add to existing RSGB awards can be accepted. The existing sticker design has been retained. Claims should be made using the application form, rules and squares checklist available below. Please note that data provided for the above awards will be held by the UK Microwave Group for the purposes of providing a published list on the UKUG Web Site and in the group's newsletter Scatterpoint, of achievements by award holders. Data will not be used for any other purposes. You do not have to be a member of the UK Microwave Group to lodge a claim. The decision of the UK Microwave Group committee on the validity of claims is final.